Wal-Mart rolls out collectible box of Twinkies in 1600 stores - three days ahead of planned nationwide return after Hostess bankruptcy. It's Twinkies' comeback day at Wal-Mart, three days ahead of the snack's anticipated return nationwide. Wal-Mart is rolling out the first batch of new Twinkies in 1,600 stores on Friday. And by Sunday, Twinkies will be available in 3,000 Wal-Mart (WMT) stores, according to company spokeswoman Veronica Marshall. Wal-Mart is selling Twinkies in an exclusive collectible box that says "First Batch" on the packaging and has the new Twinkies tagline: "The Sweetest Comeback in the History of Ever." They cost $2.98 for a box of 10. "These are the first Twinkies since production restarted," Marshall said. "Each box that arrived to us contains fresh Twinkies and not frozen ones." Wal-Mart had planned to start selling Twinkies on Monday but pushed up the date when it was able to "get the inventory earlier," Marshall said. The world's largest retailer wasn't the only store that gave shoppers a sneak peek. Grocery chain Albertsons, in a much smaller rollout, stocked Twinkies in about 100 stores on Thursday and will expand over the weekend, said company spokeswoman Christine Wilcox. Kroger (KR) has Twinkies in about a quarter of its stores today, according to a spokesman, and they'll be available in all Kroger stores by Monday. 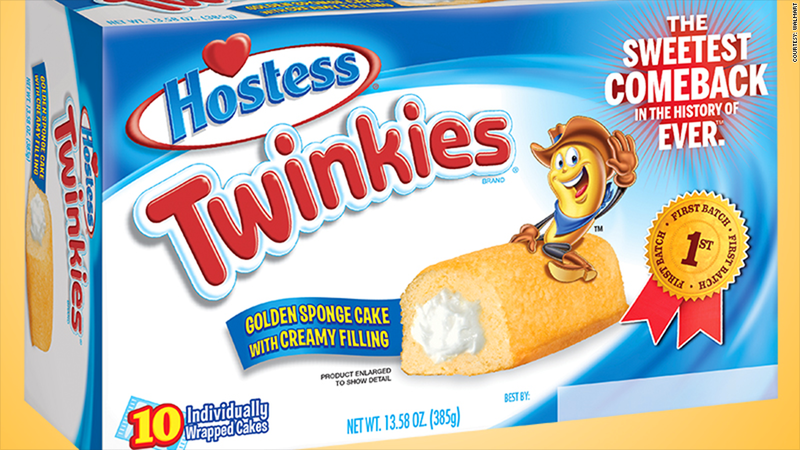 For its part, Twinkies maker Hostess Brands said in a statement to CNNMoney that Monday remains the official Twinkies launch date for all retailers. "Hostess has shipped product to every major retail customer across the country. ... These shipments were coordinated to give everyone the same opportunity to display the product on July 15th," Hostess said. "Hostess has not, and is not, giving any particular retailer exclusivity or preference to have products first." On Sunday, Wal-Mart will also start selling other Hostess-branded products, including mini muffins, fried fruit pies and cupcakes. The retailer will roll out Ho Hos, Zingers and SuzY Q in late August, and the cream-filled chocolate Sno Balls in late fall, according to Marshall. Does Wal-Mart anticipate a Twinkies rush this weekend? It could happen, Marshall said. "But we guarantee we'll keep Twinkies in stock."